3. The South West New Territories Recommended Development Strategy, incorporating public views where appropriate, was endorsed in 2001. It sets out a broad land use framework to balance development and conservation needs in accordance with the principle of sustainable development, with particular emphasis on turning the sub-region into a Tourism, Recreation and Leisure centre. A number of development projects are being implemented. 4. 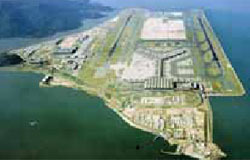 The Hong Kong International Airport currently has an annual capacity of 45 million passengers and 3 million tonnes of cargo. The ultimate annual capacity would increase to 87 million passengers and 9 million tonnes of cargo. Under the framework of the Hong Kong International Airport Master Plan 2020, expansion of the facilities is in hand, including the development of additional cargo facilities, AsiaWorld-Expo and SkyCity Phase 1. 5. Hong Kong Disneyland Phase 1 at Penny's Bay is under construction. Arrangements have been made for possible long term expansion of the theme park in phases. Specifically, the Phase 1 operator is given an Option to purchase the site to the east of Phase 1 for Phase 2 development and a Right of First Refusal to purchase land possibly to be formed next to the Phase 2 site for possible Phase 3 development. 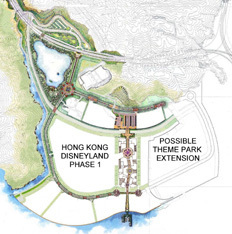 Evidently, Hong Kong Disneyland would be the anchor for further tourism development in Lantau. 6. 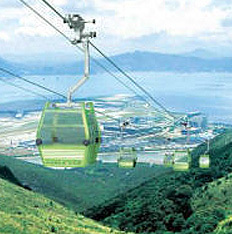 Tung Chung Cable Car, together with a Theme Village and other infrastructure improvements at Ngong Ping, is under construction. The Study on Revitalisation of Tai O recommending the preservation of the fishing village and enhancement of its visitor appeal has been completed. The South Lantau and Mui Wo Development Feasibility Study has been undertaken to review the land use potential in South Lantau. 7. At present, Lantau has a total population of about 88 000. Over 70% is residing in Tung Chung. With the new economic infrastructure proposals in Lantau and changing planning circumstances, the remaining development in the North Lantau New Town would be subject to replanning. Other major settlements include the residential suburb at Discovery Bay, the rural township at Mui Wo, and village clusters at South Lantau and Tai O. No substantial growth is envisaged, having regard to their rural character and limited transport and infrastructure capacities.